Every day you breathe in over 100,000,000 viruses. Antibodies help your immune system fight back. Viruses are deadly. They kill twice as many people as cancer does – around 15 million people every year. Vaccines have saved many lives, but for most viruses there is no cure. Understanding how viruses work and learning how the human immune system deals with them is critical to finding new treatments. 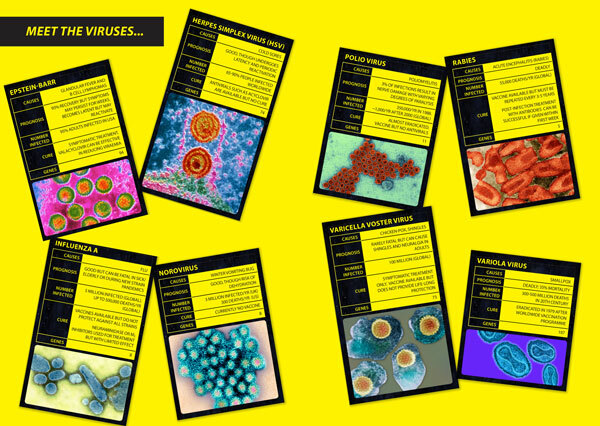 Viruses are all around us – everyday we each breathe in over 100,000,000! Most of these are harmless, but some can make us sick. Viruses are tiny agents that invade the cells of our bodies and hijack the microscopic machines inside our cells to produce millions of copies of the virus, assembling a viral army which bursts out of the cell, spreading the invasion through the body. Viruses aren’t actually alive – they don’t grow or move themselves, or eat or use energy, and they can’t reproduce on their own. This is why they must invade our cells – so that they can take advantage of the complex machinery, nutrients and energy in our cells, and force the cell to make millions of copies of the virus using the genetic blueprint carried in the virus. You are constantly exposed to viruses – in the air you breathe and things you touch and water you drink. During an infection viruses invade your cells in order to reproduce. Each cell becomes a virus factory, which eventually bursts, releasing 10,000 new viruses which can go on to infect other cells (adenovirus). During an infection you may have several million viruses in every millilitre of your blood. The human body makes use of antibodies to fight disease. You have ~3x107 unique antibodies. The shape of the antibody determines what it can bind to. Because you have so many different antibodies, almost any shape can be recognised. After recognising an invading virus, the cells (B-cells) that produce the individual binding antibody are stimulated to divide. Each antibody producing cell can produce 2000 antibody molecules per second. After 4-7 days, antibody (IgG) is detectable in blood. Antibodies bind to viruses, marking them as invaders so that white blood cells can engulf and destroy them. Until recently, antibodies were thought to protect on the outside of cells. TRIM21 binds to viruses on the inside of cells. TRIM21 sends viruses to the cell’s recycling system (the proteasome) where the virus is destroyed. Two antibodies per virus are enough for TRIM21 to send the virus for destruction. Understanding how TRIM21 and antibodies work may help scientists devise new therapies for virus infection. Antibodies are one of the key weapons against viruses in our immune system’s arsenal – they are molecules made by our white blood cells to fight off invaders and keep us healthy. Each of us has more than 10 billion different kinds of antibody – that means there are more different antibodies inside you right now than there are people in the world. Although antibodies all have the same basic ‘Y’ shape (see picture), they can have any shape at their ‘ends’, so for every shape of virus, there is an antibody to match. Antibodies with the right shape for a virus will stick onto it and alert your cells to destroy the virus. This also turns the cell that is making the right shaped antibody into an incredible antibody-making factory, churning out 2,000 antibodies every second! Antibodies are proteins that recognise and bind parts of viruses to neutralise them. Antibodies are produced by our white blood cells and are a major part of the body’s response to combatting a viral infection. Antigens are substances that cause the body to produce antibodies, such as a viral protein. Antibodies bind antigens very specifically like a lock and key, neutralising the virus and preventing its further spread. Antibiotics are substances that kill bacteria. They are not able to neutralise viruses. Bacteria can become resistant to antibiotics, so misusing them for non-bacterial infections could have serious consequences rendering the antibiotic ineffective. This is actually a really hard question to answer. Viruses are much simpler than other organisms that we definitely consider alive. For instance, you have about 25,000 genes, whereas HIV has eight. But simple doesn’t necessarily mean not alive. 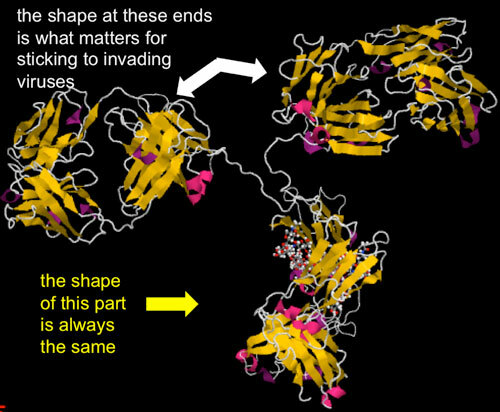 Viruses must also use a host cell – and all its complex machinery – in order to replicate. This means that a virus can’t replicate without a host. But then you could say the same thing about a head louse, and we would definitely call a louse alive. So where do we begin? Humans do all these things but viruses do, at best, four of them. Viruses do not grow, metabolise or maintain a constant internal environment. So by this definition, viruses are not alive. Have you ever wondered what exactly is in the needle when you get a vaccine, or how that works to protect you against a disease? A vaccine against a virus actually contains virus – usually either a dead, weakened, or slightly different version of the virus it protects you against. Deliberately injecting a virus may seem like a very strange approach to preventing infections, but is a really effective strategy, because your immune system reacts to the vaccine and makes lots of specific antibodies with the right shape for the vaccine virus. Once you’ve made antibodies to a target, your immune system ‘remembers’ the shapes of antibodies that were effective. This means that if you’ve had the vaccine and then get infected by the real virus, your immune system has a head start and quickly makes lots of the right kind of antibodies, which destroy the virus before it has the chance to spread through your body and make you sick. The first successful vaccine was developed in 1796 against the smallpox virus, which killed about 500 million people in the 20th century. The vaccine was extremely good at protecting people from infection, and was given to people around the world, so that in 1979 smallpox was officially declared to be extinct. This is an amazing example of how powerful vaccines and antibodies can be in protecting us against infection.